Most people know Portugal as a producer of sweet red dessert wines called Port and maybe a few other folks know Portugal produces some really good red wines. It seems hardly anybody knows Portugal as a source of exceptional white wine. People who have visited Portugal on vacation seem to know the simply Vinho Verde wines...and we sell a modest amount of Casal Garcia's because it's well-made, low in alcohol, lightly fizzy and it provides a measure of nostalgia to vacationers who are back home, thousands of miles away from being a tourist. We first discovered the wine of Soalheiro while visiting Portugal. A restaurant which was highly-regarded for its fresh seafood had been suggested to us and we reserved a table. The wine list featured a number of interesting wines, but we had to order a bottle of Casal Garcia since a friend works for the winery (he's a family member). The Vinho Verde was 7 Euros on the wine list. We ordered all sorts of seafood. And, having drained the Casal Garcia bottle, we asked the waiter if he could suggest something a bit more interesting and still friendly enough to pair with the mass/mess of prawns, barnacles, oysters, etc. He didn't hesitate and pointed to the Soalheiro entry on their wine list and it was a bit under 20 Euros...and what a delight this turned out to be! Back home we were able to track down Soalheiro...and we thoroughly enjoyed the 2009 and now the 2016 is in stock. And it's delightful! The name of the winery and its brand, Soalheiro, is a reference to the sunny locale in the very northernmost point of Portugal. They're in the town of Melga�o. Much farther north and you'll need to speak Spanish. In the 1970s Jo�o Ant�nio Cerdeira planted some Alvarinho just outside downtown Melga�o. He had done his military service in Africa and returned home, working as some sort of tax inspector. After the 1974 April Revolution, Cerdeira decided to throw caution to the wind and he planted, against the law at the time, Alvarinho. Scofflaw! In his early years he'd visited Burgundy and became familiar with the 'foreign' winemaking practices in France. Today he and his son Luis produce a top Alvarinho and their Soalheiro brand is highly-regarded in Portugal. The wine comes from mature vines which are now about 35 years of age. Granite soils. Hand harvested grapes. Indigenous yeasts. No oak. The resulting wine is marvelously minerally and yet wonderfully fruity. There's a steely aspect to the wine which might remind you of some Chablis and yet there's a fruit and floral note which might recall a Riesling from Germany, but with a bit more austerity. I've often brought a bottle of this to a dinner in San Francisco of judges at the SF International Wine Competition. It's "wowed" the folks at my table and was refreshingly dry and crisp. Dining in Sonoma at the famous Portuguese restaurant La Salette, we ordered a bottle of the 2010 (some years ago now) to pair with our meal. Another grand bottle! We had brought a magnum to the SF International dinner which was perhaps 5 years of age...We were curious to see how it was showing and if it was perhaps a bit too old. It was stellar and was showing remarkably well. Even a bit more special is their Primeiras Vinhas bottlings. It's from their first plantings/oldest vines of Alvarihno. 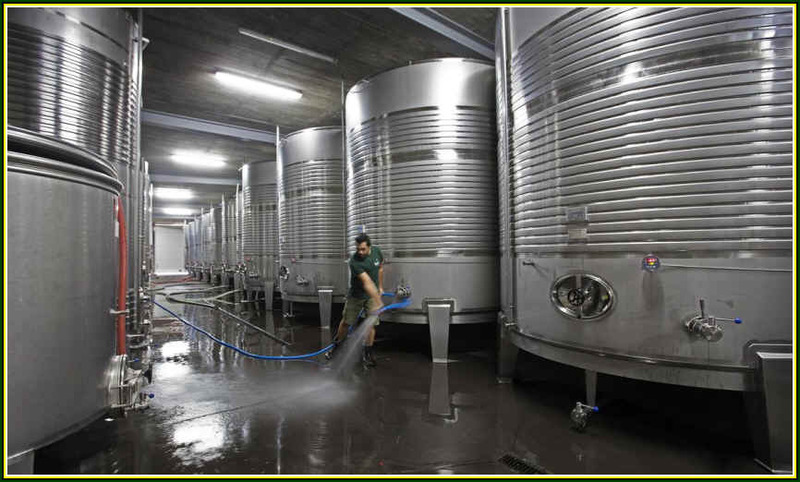 The grapes are hand-harvested and the juice is settled in a tank before they initiate the fermentation. Perhaps 15% of the wine sees a wood barrel, but more for giving an additional note of complexity than it is for providing a note of oak. And it's slightly more complex than the regular bottling and as thoroughly charming. Though the history books have many chapters covering this estate, the most important paragraphs have been written rather recently. The property is located in Reguengos de Monsaraz, a little more than a hundred miles south of Lisbon in the Alentejo region. It's a huge estate and quite historical. It's so big, they have two winemaking facilities, one for red wines and one for white! The current owners have had the place since 1973 but it's only since 1989 that they've been actively bottling and selling their wines. Under the guidance of Australian winemaker David Baverstock, this winery has some delightful wines. We've often found good wines here. The 2016 Reserva White is dynamite! It's a blend of Ant�o Vaz, Arinto, Roupeiro and NO Semillon this vintage. Some of the juice is fermented in stainless steel and another portion sees barrel fermentation. They use both French and American oak and the wood is beautifully integrated into the wine. There's a stony, minerally character in the 2016 and the oak is just right, adding complexity to the wine. 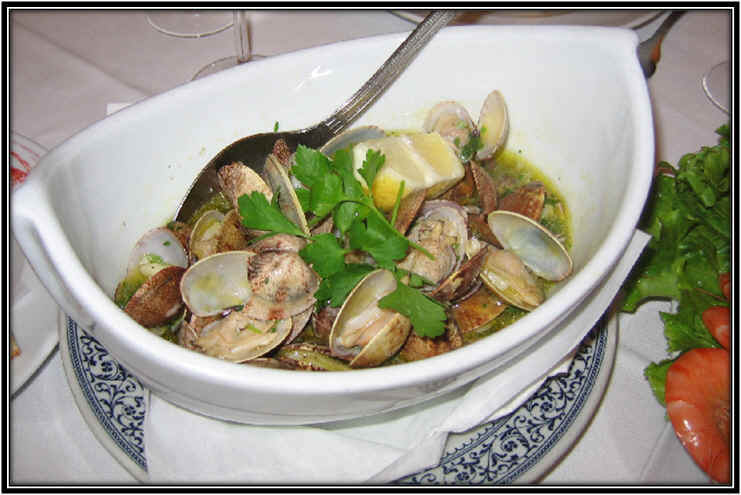 We had a previous vintage with that bowl of clams & garbanzo beans (on the left) and this was a great match...the wine overshadowed a top Pecorino (white wine from the Abruzzo region) from Italy at a dinner fest. The red is a 2014 and it's a blend of Aragon�s, Trincadeira, Cabernet Sauvignon and Alicante Bouschet. It was a rather dry winter and there wasn't much rain during the growing season and this produced a wine of deeper concentration than normal. This vintage seems to show more dark fruit notes and not as much oak as the wines we'd tasted a few years ago. Sixty percent of the barrels for this were of American oak and the rest French cooperage. Ellen is especially pleased with this wine. 2011 Espor�o White...This was Delicious! The wine was due to hit the market in 2001 or 2002, so they ended up having to change the label following the 9-11 catastrophe. This terrific wine is the work of the famous Douro winemaker Dirk Niepoort. His ancestors were well-regarded for their Port wines and we still offer some terrific fortified wines from Niepoort, but he seems to be devoting increasing attention to making table wines. We've tasted a number of good Niepoort table wines, but admit we're confused by some of the labels and the hierarchy of his wines. You really do need a program to figure out the players! Redoma, Vertente, Batuta, Converso, Dialogo, Surf, Hunter, Drink Me, Drink Me Kali, Drink Me Swimming, Fabelaktig, Fabelhaft, Fantasi, Gestolen Fiets, Lacplesa, Melusina...some labels aimed directly at a target market in the home language of a particular country and others being Niepoort "core" wines. Well, he changed his "recipe" for D�cil over the years. This wine started out as something reminiscent of German Riesling, relatively low in alcohol and keeping a bit of unfermented sugar. The current incarnation sees a wine of slightly higher alcohol (this is a mere 11%) and it's quite dry. If you taste this wine "blind," you'll most like peg it as something French, possibly a Chablis or some nicely austere, minerally white. D�cil comes from the Vinho Verde appellation and it's made of the Loureiro grape. Granitic soils may contribute to the character of the wine, of course. But vinifying it in stainless steel and not exposing it to oak seems like a good idea. The 2017 vintage hits the nail right on the head. Delicious. Pair it with some seafood...filet of sole, sand dabs, rock shrimp (the sweetness of the shrimp is a counterpoint to the austerity of this wine), crab, etc. Shellfish will be a good accompaniment with this, too. The Quinta do Carmo property is actually owned by Julio Bastos who makes the Dona Maria wine near the town of Estremoz. Bastos had sold his share of the property and the owners then built another winemaking facility not far from the Carmo "home base." One of the partners in the Quinta do Carmo property were the Rothschilds of Chateau Lafite. They, too, found the Portuguese wine business to be a daunting challenge and the Rothskids sold the place to the Bacalhoa Group...and it seems the place is in good hands. Maybe better than before? The 2007 Quinta do Carmo is quite good. The blend includes Tempranillo, Alicante Bouschet, Trincadeira and Cabernet Sauvignon...and the wine spent about a year in small French oak cooperage. There's a nice dark fruit character here and we like the mildly cedary notes from the oak. It's showing quite nicely now and we think it's close to its peak. Pair this with grilled or roasted meats...it can take the place of a bootle of Bordeaux or Cabernet on tonight's dinner table.